LARAMIE, WY--(Marketwire - January 28, 2010) - IDES Inc. announced the newest improvement to Prospector, a search engine for plastic material datasheets used by thousands of design and process engineers. 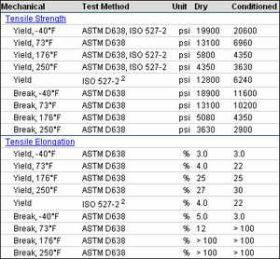 Datasheets for more than 1,800 polymers now show conditioned and dry plastics data side-by-side to easily view all data for a material, providing designers all the information they need on one datasheet. "Dry" refers to data that is obtained from a sample of material with equivalent moisture content as when it was molded (typically < 0.2%), while "Conditioned" refers to data obtained from a sample of material that has absorbed some environmental moisture at 50% relative humidity prior to testing. The vast majority of dry and conditioned data is seen with polyamide (Nylon) materials. "Dry and Conditioned data for plastic materials listed in Prospector has always been available, though on separate datasheets. Our customers requested to have the data available on the same datasheet; it's been something we've wanted to correct in order to represent the data as accurately as possible. The timing and technology came together and we decided to fix it," said Mike Kmetz, president and founder of IDES. For more information, visit IDES Prospector. For more information, visit IDES.com. Dry plastics datasheets now appear in the Prospector search engine from IDES side by side with conditioned plastics data.